A PRE-WAR CASTLE ALONG THE HIGHWAY. Those traveling in Quezon know that they are in Sariaya when they see the imposing twin-spired, brick roofed-mansion along Maharlika Highway. Lured by this impressive pre-war castle of Tayabas Provincial Governor Natalio Enriquez, we made an unscheduled stopover in Sariaya the first time we traveled the road on this part of Quezon province. EXPLORE SARIAYA. Curious to see what’s inside one of Sariaya’s pre-war mansions, we made arrangements to join a tour led by Tina Decal of Kulinarya Tagala in 2008. At that time, Tina led us inside the Gala-Rodriguez Mansion. Four years after that tour with Tina, we’re back in her hometown. This time she introduced us to Eric Dedace, Sariaya’s self-appointed historical researcher and chronicler. SARIAYA HISTORY. We met Tina and Eric under the massive acacia tree in front of the church of St. Francis of Assisi. While showing us an old picture of the church patio, Eric pointed out that much of the tree’s expansive branches have been torn down by a recent storm. The enormous tree was a good starting point of our walking tour since it has been there for centuries as a mute witness to the town’s history. The foundation of the town of Sariaya coincides with the building of the first church along the shores of Barangay Castañas in 1599. Like with other towns at that time, the natives organized around the church within the hearing distance of the church bells. However, natural calamities and frequent Moro raids prompted the transfer of the church, farther away from the shore, towards the foot of Mount Banahaw. STO. CRISTO DE BURGOS. In 1703, the church was transferred to Lumang Bayan. It was during this time that the Franciscan friars received a replica of the Sto. Cristo de Burgos from King Philip V. Perhaps it was the constant threats from marauding Moors that prompted the friars to request a replica of the image of the crucified Christ used by El Cid Campeador in the battle against the Moors in the 11th century. A series of natural calamities destroyed the town of Lumang Bayan. This was then followed by a Moro invasion which burned the town to the ground. Surviving the holocaust was the unscathed image of the Santo Cristo de Burgos. MIRACLE OF THE STO. CRISTO. According to one folk story, the image was said to have been wrapped in white linen and then carried by men in search of a place to build the new church. After resting under a tree, the men found the image to be extremely heavy and cannot be lifted even with the help from other men. Taking as a sign, the town folks built the stone church on the site. Built in 1748, the Church of Saint Francis of Assisi survived the test of time. Behind its intricately carved retablo is the miraculous image referred to as the Ang Mahal na Señor Sto. Cristo de Burgos. One of the miracles of Sariaya’s beloved icon has to do with the Pacific War. It is said that when American air raid bombers hovered Sariaya, the town was said to be shrouded in clouds. The town folks believed that the Sto. Cristo made the clouds from Mount Banahaw rolled down Sariaya, concealing their town from the American bombers. Surviving the war are Sariaya’s grand houses. ARCHITECTURAL GEMS OF SARIAYA. The imposing architecture in Sariaya is attributed to the wealth brought by the coconut boom in the 1900s. At the onset of World War I, the Philippines rank fourth as the world’s supplier of copra. This was because aside from the rise of the soap and margarine production abroad, coconut oil became in demand for its high glycerin content, which is essential ingredient for the manufacturing of explosives! Owners of coconut plantations in Southern Luzon, including Sariaya have benefited so much from the coconut boom that they afforded to remodel their houses following the architectural trend of the that period. These houses built in the 1930’s Art Deco and Art Nouveau fashion were designed by young and talented architects Juan Arellano, Juan Nakpil, and Andres Luna de San Pedro. OLD MUNICIPIO BY JUAN ARELLANO. Eric showed us a picture of the old Municipio, which like most government buildings at that time looked like an over-sized bahay-na-bato. That has been replaced in the 1931 with an Art Deco structure designed by Juan Arellano. ART DECO. The focal point of Sariaya’s Municipio is the central towering projection topped by a receding lantern. Flanking all sides are busts of Grecian women. Decorative enhancements like the zigzag and wave like moldings plastered all throughout the building were the typical Art Deco motif seen worldwide while the banana leaf gives the structure a local flavor. RIZAL MONUMENT. Fronting the Municipo and the church is the town park with a monument dedicated to Jose Rizal and the Glorita. Unveiled on December 30, 1924, the Jose Rizal Monument shows the national hero with a feather plume. Although the Rizal statue is similar with what we see throughout the country, the one in the Sariaya town plaza has a tableau of a mother and child. Tina explained that this mother and child sculpture is a representation how much Sariaya values education. GLORITA. Also built around that same time with the Rizal Monument was the glorita. The elevated structure that looks like a bandstand has eight Grecian maiden dressed in Filipiniana. Each statue holds a torch bringing to mind the Statue of Liberty. The torches used to have customized flame-shaped glass bulbs fitted with electrical wirings. Similar with how towns were laid out during Colonial times, the rich and influential members of the society built they’re housse around a plaza near the church and town hall. Eric explained that in Sariaya, the landed gentry lived in the vicinity of the church park. They are called the taga gitna. Those who lived farther away from the periphery of the town were called the taga tabi, the ordinary people who own little or no property. Furthermore, the people were divided into the urbane taga bayan and those from the barrios or linang. NATALIO ENRIQUEZ MANSION. Tayabas Provincial Governor Natalio Enriquez built a Beaux Art castle next to the church. Designed by Andres Luna de San Pedro, the son of painter Juan Luna in 1931, the Natalio Enriquez house was a venue of luxurious events in pre-war Sariaya, including the 1938 wedding of Alicia Enriquez to Manuel Gala where Philippine Commonwealth First Lady Aurora Aragon Quezon was principal sponsor. Aside from being one of the three houses in Sariaya to be declared as a heritage house by the National Historical Commission, the Natalio Enriquez mansion has been opened to visitors. The interior is furnished with American and European decor. Most of the Art Nouveau and Art Deco furniture were also designed by Architect San Pedro. RODRIGUEZ HOUSE. Occupying an entire block near the church park is the Catalino and Luisa Rodriguez Ancestral House. Don Catalino Rodriguez was Sariaya’s town Presidente (equivalent of mayor during the American occupation period) from 1908-1909. Historical account claimed that the house served as a venue of important political events, including the victory party in honor of President Manuel Quezon and Don Claro M. Recto. A COLONIAL BAHAY NA BATO. Compared to the Art Deco Gala-Rodriguez Mansion and the Beaux Arts Natalio Enriquez Castle, this ancestral house maintains a Colonial Bahay-na-bato style with huge colorful stained-glass windows, high celing, art nouveau wall paintings, and intricately-carved lattices on the celing. Renovated in 1922, carpenters and artisans from Pampanga and Batangas used the best hardwood in constructing this massive bahay na bato. EPILOGUE. Good news is that this house has been opened to the public as Villa Sariaya, a lifestyle museum where visitors dress-up in full Filipiniana regalia and experience walking around the spacious living room and grand dining hall, under the florid lattice work, reliving the genteel days when coconut barons ruled Sariaya with aristocratic grace and fervor. Our fascination for ancestral houses inspired us to find the way to see what’s inside the art-deco mansion located at No. 44 Rizal Street, Sariaya, Quezon. Known as the Gala-Rodriguez Mansion, this intricately-designed house has a private museum that is seldom open to the public. We met Diane Chua of Southeast Travel Corporation who organizes a Culinaria tour of Laguna and Quezon. Part of the Culinaria tour is to dine at the mansion’s restaurant by the pool. Diane made special arrangement for us to see the mansion’s interior. The Gala-Rodriguez Mansion is a Sariaya landmark. It was the house that the people would refer to as the Malaking Bahay (big house). This house of Dr. Isidro Rodriguez was his gift to his ailing wife Doña Gregoria Gala. It was designed by architect Juan Nakpil and its French Provencial furniture was commissioned by Don Gonzalo Puyat in the 1940s. The house was built in the early 1930’s. It was a time of depression when the coconut plantations were plagued by what was known as the leaf miner crisis. Doña Gregoria was very determined to build her dream house for her seven children. The house was completed and the family has decided move to their new home on the occasion of Doña Gregoria’s birthday. However, the matriarch passed away two days before the celebration of her birthday. Historical accounts claimed that during the outbreak of the Japanese Occupation in 1942, three Japanese officers occupied the house. They resided at the second floor while the family and members of the household were allowed to stay at the first floor. It was during this time when a certain Japanese General Ashima courted the eldest of the Rodriguez sisters –Doña Carmen Rodriguez. The Japanese suitor would play the guitar and dedicate love songs for her, as well as provide the family with supplies of food and clothing. However, the family remains doubtful of the intentions of the Japanese suitor that they would hide Doña Carmen in the cellar. It was said every time the Japanese officers were away, the cellar served as meeting place which could accommodate a hundred people. The guerillas learned that the house became the residence of Japanese officers. So during the time when the Americans were about to liberate the town, the guerrillas intentionally sent a map to direct the American forces to bomb the whole house. Before the air raids and bombings took place, the people left the town purposely leaving the Rodriguez family uninformed since many feared that General Ashima may have a way of tracking down where Carmen would be hiding. However, there was one concerned family friend who went back to tip off the Rodriguezes about the plans. On that same day, the family vacated the mansion. The first bomb exploded at the front gate, the second blasted a huge, twenty-foot-deep hole (from which the big swimming pool was built), and the third was a dud that went through the roof and got stuck in the stair banisters. Several houses were looted while the residents were away. But because of the bomb that did not explode, no one had dared to come near the house fearing that the bomb might detonate. With the bomb in place, not a single furniture was lost from the house. The bomb was later moved to the garage where it was thought to be safe. A welcome party for Americans was held in the house a week after the liberation. An orchestra was brought in to enliven the affair. In the midst of the riotous dancing and merriment, the young sister of Carmen, Exal, mentioned to an American soldier about the bomb which that was kept in the garage. Immediately, the festivities stopped. A bomb disposal unit was called in to remove the live bomb to safety. It was in the 1950’s when Doña Carmen was married to Batangas Judge Vicente Arguelles. Their marriage bore them a child which they named Gladiola. It was also during this time that the swimming pool was completed. Originally planned to be the biggest and deepest swimming pool, it was downsized to 15 feet-deep. During the 1960’s a Great Fire has befallen the town. Houses went up in to smoke. While the fire continue to engulf neighboring houses, Doña Carmen gave an order that the furniture be thrown into the pool. However, the flames were about to leap into the house when the wind fanned it away. What attracted us to see the town of Sariaya in Quezon Province are the proud existence of grand ancestral houses and an Art Deco-inspired public edifice. Two of these ancestral homes and the public building were designed by our national artists. Most of these turn-of-the-century buildings are clustered around the Church of Saint Francis de Assisi and the town plaza. As the town prospered from the coconut industry during the pre-War years (from 1919 to 1930), a local elite called the pricinpalia emerged and dominated social and economic life of the town. The money earned by the landed gentry afforded them to remodel their once already imposing bahay-na-bato into ornate American and European-inspired mansions. The town was set on fire by the Japanese in 1945 which destroyed most of the stately Spanish and American style houses and the Great Fire during the 1960s burned the remaining ones to the ground. Those that survived particularly around the town plaza are being preserved for posterity. 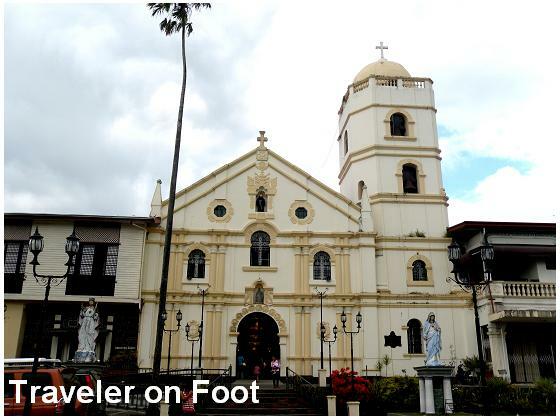 Beside the Church of Saint Francis de Assisi is the impressive twin-spired, brick-roofed house of former Tayabas Governor Natalio Enriquez. 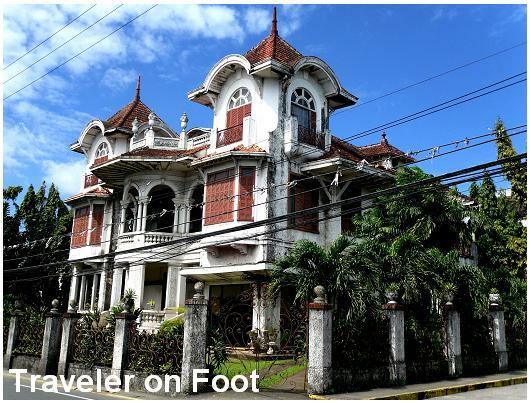 This house was designed by Andres Luna de San Pedro, son of Filipino Master Juan Luna. Behind the Marquez Mansion is the Alvarez Residence. Built in 1703, it was the oldest in the town. It once served as the town’s municipal hall. Recently, it was converted as the Sariaya Museum. Today, the Sariaya Museum was moved to a different building. Another old and equally stately ancestral home is the Doña Margarita Rodriguez Mansion located along Rizal Street. Built in the 1930’s for Dr. Isidro Rodriguez and Doña Gregoria Gala. The house was designed by Juan Nakpil and its furniture was custom-made by Don Gonzalo Puyat. The old municipal hall was replaced by Sariaya Presidente Hilarion Valderas in 1931 with an art deco-inspired edifice designed by Juan Arellano.